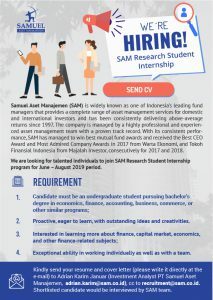 We are looking for talented individuals to join SAM Research Student Internship program for June – August 2019 period. Kindly send your resume and cover letter (please write it directly at the e-mail) to Adrian Karim Januar (Investment Analyst PT Samuel Aset Manajemen, [email protected]), cc to [email protected] No later than 03 May 2019. Shortlisted candidate would be interviewed by SAM team.